With our latest batch of interns having just completed the theoretical portion of ‘Human Movement’ for our in-house internship at Strength Culture, I thought it would be a good opportunity to delve into some deeper anatomical underpinnings that aren’t always discussed, however, they have great value in programming and movement considerations. Stability: the ability to resists forces and perturbations to alignment whilst moving. Stiffness: active and passive structures resisting movement. Albert Einstein brought to life the idea that there is no such thing as absolute rest or absolute motion and that everything is relative within the universe. The great thing about Einstein’s theories of the universe is that they are relative to human movement, too. When one joint moves we perceive that joint as the only thing moving because we reference it to stationary objects surrounding the person, however, the relative changes of surrounding joints and tissues can significantly influence muscular demands, tension and the effectiveness of your training interventions and exercise selections. Let’s discuss how the theory of relativity can apply to human movement. I was first exposed to this idea through Eric Cressey’s blogs, who later led me to the well of wisdom that is Shirley Sahrmann and her textbook ‘Diagnosis and Treatment of Movement Systems and Impairments Syndromes’. ‘Stiffness’ is the ability of active and passive structures to resist movement. An example of this is when we flex the elbow, the bicep has become ‘stiffer’ and will no longer allow elbow extension to occur. This would be described as ‘active’ stiffness as it is controlled by the central nervous system. ‘Passive’ stiffness would be a tissue, not controlled by the central nervous system, providing stability and resisting movement of joint surfaces. The ACL provides stiffness at the knee to resist anterior translation of the tibia relative to the femur. Stiffness is similar to stability in the fact that stiff structures can resist movement/ forces, however, stiff structures have the capacity to completely change how we move through global ranges. ‘Relative Movement’ is easier to make sense of, as this simply relates to how one structure moves in relation to adjacent structures. An example would be when the scapular moves FORWARD and UP it is relative to the rib cage. So, moving the rib cage BACK and DOWN would achieve the exact same ‘relative’ movement or upward rotation. How can Relative Stiffness and Relative Movement have impact on how we move and load the body? When we actively engage serratus anterior in core/ flexion based drills we effectively shut down the involvement of it’s antagonist muscles, of most note in this example the latissimus dorsi. This increased stiffness created by the serratus anterior effectively shuts down the lats ability to extend the lower back and drive the rib cage anteriorly. This is because the serratus anterior’s function is to shift the rib cage BACK and DOWN relative to the scapluae, the direct opposite effect that the lat has on the rib cage of FORWARD and UP (extension of the lumbar spine and lower thoracic spine). Example 1) Blue arrow depicts the Scapular moving FORWARD and UP (upward rotation) whilst the yellow arrow depicts the Rib Cage moving BACKWARD and DOWN relative to the scapular. The scapular has moved further, relative to the rib cage, than that seen in example 2 because the scapular has moved in the complete opposite direction of the rib cage. This will create more engagement of the serratus anterior as you are taking the muscle through its full ROM potential. Example 2) Blue arrow depicts the Scapular moving FORWARD and UP (upward rotation) whilst the yellow arrow depicts the rib cage moving anteriorly. This is because the lats ‘stiffness’ overpowered the ‘stiffness’ generated by the anterior core to resist this extension moment. As a result the relative amount of upward rotation is less than the first example as the scapular has moved in the same relative direction of the rib cage and hence, less ROM has been achieved for the serratus anterior. This is easy to experience with a simple ‘reach’ cue in the plank. The Plank is a great anterior core strength and endurance exercise. When you ‘reach’ through the floor with your elbows you can increase active stiffness in the serratus anterior, decreasing the relative stiffness of the latissimus dorsi and spinal extensors which creates a posterior shift of the rib cage, allowing far greater anterior core core engagement through spinal flexion. Blue Arrow = Scapular/ Serratus Anterior. Yellow Arrow = Rib Cage position relative to the scapular. 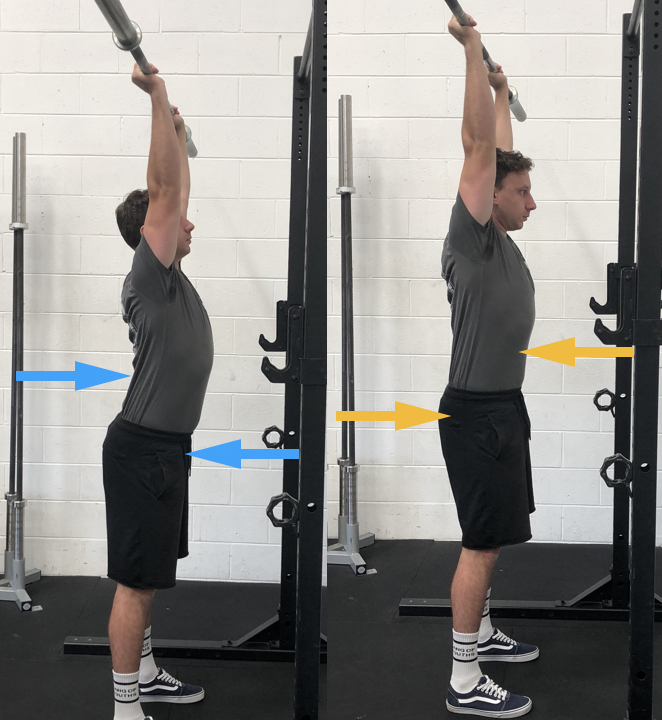 As a result of the relative positional changes of the Rib Cage and Scapular in picture 2, we see the spine moves from extended to flexed and we get increased anterior core engagement. This same phenomena is experienced with every single core/ flexion based drill. When you cue a ‘reach’ of your shoulder blades forward the rib cage is shifted BACK and DOWN relative to the scapular. The relative stiffness of the flexor muscles (serratus, rectus, obliques) is increased compared to the extensor muscles (lumbar spinal erectors, QLs, lats) and you engage greater amounts of the flexor muscles. By reaching you increase the relative stiffness of all flexor muscles (serratus, rectus, obliques) in flexion based exercises. 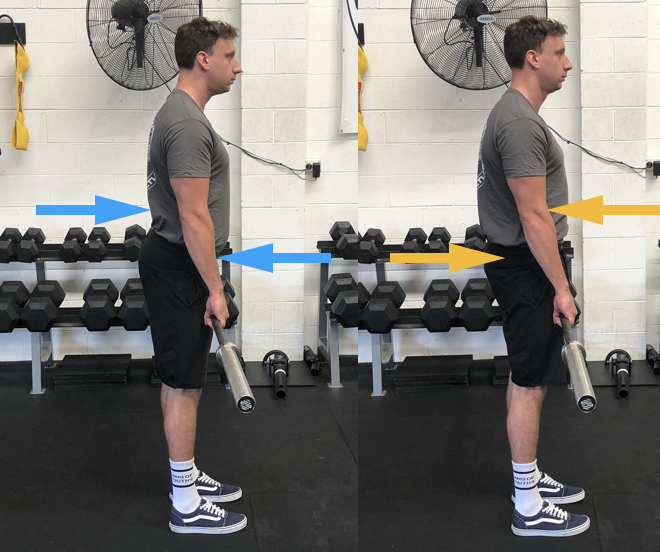 The inability to extend the hip during deadlifts and squats at lock out because the tissues that extend the lumbar spine are ‘stiffer’ than the structures that extend the hip and maintain a strong core position. Relative stiffness of lumbar erectors is greater then the anterior core and glutes. The inability to press overhead without sacrificing lumbar spine position. The lats/ erectors are too stiff relative to the anterior core and scapular upward rotator musculature. This is a very common presentation for lifters who have inadequate range in shoulder flexion to press overhead. The spinal extensors are ‘stiffer’ than the glutes, anterior core and scapular upward rotators. 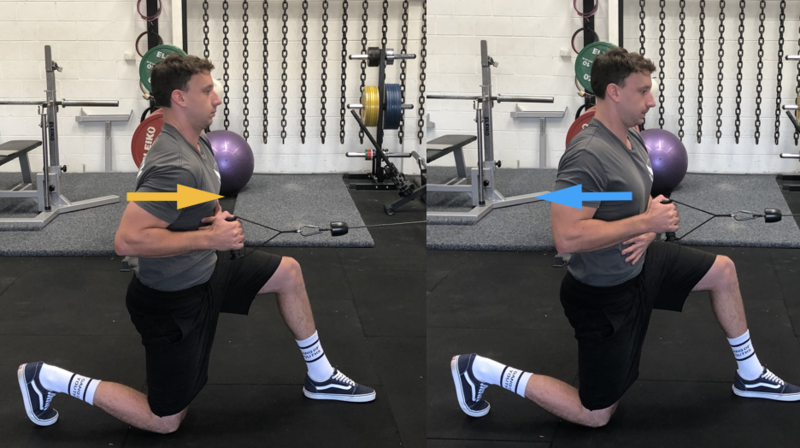 Hip external rotators not allowing hip internal rotation/ adduction on the rear leg of split squat and lunge variations. Not uncommon when the lateral hip musculature becomes increasingly ‘toned’ due to overloaded hip external rotation ranges with minimal to no internal rotation/ adduction training or people who present with excessive lumbar extension/ anterior pelvic tilt. The hip external rotators are too ‘stiff’ to allow hip internal rotation and extension to occur. Pec minor stiffness preventing posterior scapular tilt when rowing in any variation. 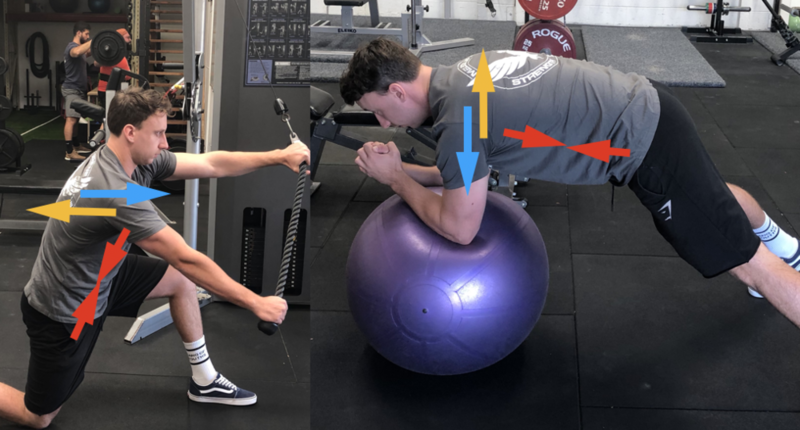 The pec minor directly opposes the lower trap and if the pec minor becomes short or ‘tight’ relative to the lower trap it will not allow a strong/ stable rowing position to be found. In all of these examples, exercise execution trumps exercise selection. Learn to strengthen the target musculature with not only the exercises you select, but also how you execute those selected exercises. This is one of 4 ‘deeper underpinnings of anatomy’ that we teach at Strength Culture, however, it has the most influence on how we move and direct the load/ tension different structures.